ALBERT BMus 1977, MMus 1979 Violist, under Guillermo Perich. Albert has held the position of Principal Viola in the following orchestras: Civic Orchestra (Chicago USA), Birmingham Symphony (USA), Thunder Bay Symphony (Canada), I Solisti Veneti with Claudio Scimone (Italy), La Fenice Opera (Venice, Italy) and Orchestra Filarmonia Veneta (Italy). He has appeared as soloist on many occasions and has toured/recorded extensively. Albert has taught beginners to advanced throughout his career. Also, Albert repairs and restores string instruments and offers Instrument Hire. 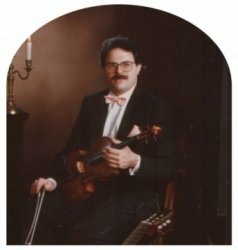 His teaching posts include Professor of Violin/Viola at Lakehead University, (Canada), Istituto Musicale Manzato (Italy), Oderzo Conservatory of Music (Italy), Harpenden Musicale (UK) and Newbold College (UK), Vale of Catmose College (Head of Strings), Oakham School in Rutland for the past 25 years. Currently Conductor of the Rutland Ensemble and Chamber Music Coach. He has performed since 1986 with his wife Melanie as part of Duo Symmetry. As part of this duo, Albert has recorded 3 CDs and appeared on television in Italy and the UK. I believe in helping every individual to reach their full potential and for lessons to be enjoyable and informative.